For Andrew Boucher, being at his desk doesn't mean all work and no play. He often occupies his hands with a toy or a small puzzle. "It keeps my head active and it keeps me in place, I suppose, and focused," he said. Boucher feels the playthings actually help unlock his creativity. "All of a sudden I'm fidgeting with something or playing with something and it just has a way of bringing the creative half of my brain to life," he added. Now, researchers say Boucher may be on to something. 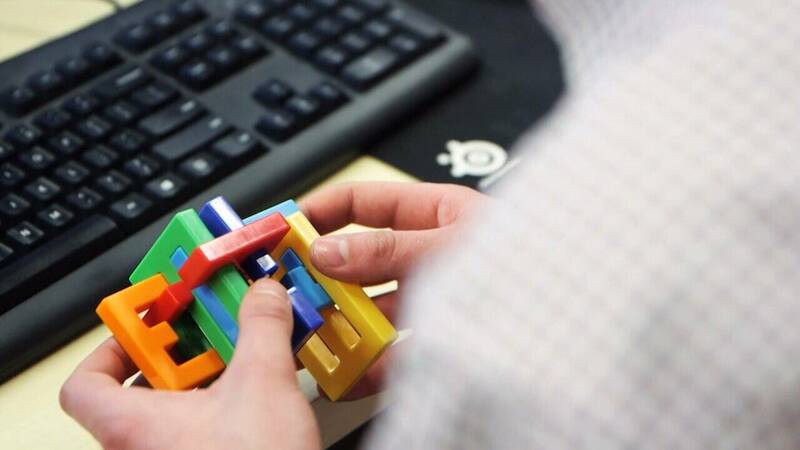 Michael Karlesky, Researcher and PhD Candidate at NYU Polytechnic School of Engineering, is investigating the potential link between fidgeting with toys at work and clearer, more creative thinking. "We're looking at how particular objects and the experience of playing with them is actually part of the thinking process and part of the self regulation process," he said. The research is ongoing, but Karlesky says they're hearing from workers that playing with toys helps with focus, problem solving, and lowering stress levels. So, what kind of toys are people picking up? "Everything from silly putty to pens, Koosh balls," said Karlesky. "The sort of toys that might inspire creative or clearer thinking is still an open question. However, we're confident that just by simple observation there's something going on here." Toy experts agree. Laurie Schacht , CEO of the Toy Book, says what she refers to as "fidget toys" are great for the desktop. "A mindless, repetitive, motor sensory activity. So, it's something that people hold in their hands and they touch. There's no 'fidget toy aisle.' It's really known as novelty toys and there are many new ones coming out every year. They're usually small, and they're usually affordable," explained Schacht. Some companies are actually facilitating a bit of play by giving employees toys. "It is something that does exist and that some corporations are embracing," said Schacht. Boucher says at his office, puzzles and toys are popular. He plans to continue to make play a part of work. "It seems to work for me. I think everything in moderation," he said. Karlesky says this type of research may lead to changes in the design of everyday workplace electronics down the road. One possibility is to design devices with materials that may incorporate elements that allow for fidgeting in some way.